Diffuser PEARLCOMB | PRODUCT | DAICEN MEMBRANE-SYSTEMS Ltd. The PEARLCOMB diffusers are used as air diffusers for activated sludge treatment such as sewage treatment and industrial waste water treatment in a wide range of fields. In addition, the first domestically manufactured membrane diffuser in Japan is added recently, and receives attention from the sewage and waste water industries as an air diffuser of the age of energy saving. 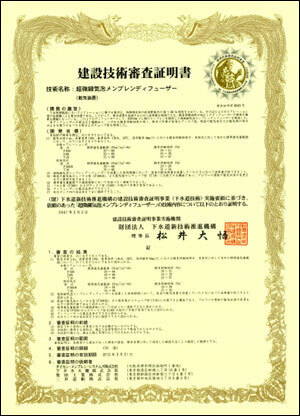 We acquired "Construction Technology Review Certificate" for these products in 2006. We will go forward with the theme of environment, human and water as a group company of DAICEL for contributing to prevention of global warming. PEARLCOMB products are classified into the following types according to the fineness of the bubble. Especially, if energy-saving measures are considered, select the superfine air bubble type. The high oxygen transfer efficiency is acquired by generating the superfine air bubble. Introduction to existing facilities is possible because it is possible to change from existing diffuser plates. It is possible to change from existing diffuser tubes. The stainless saddle improves the strength. The unit can be lifted, and it is possible to replace without draining the dirty water. The high oxygen transfer efficiency is acquired by generating very fine air bubble. It can be used for aeration and agitation in a wide range of fields. There is no need to worry about clogging. Our PEARLCOMB diffusers are provided with 3 membrane materials. It is possible to introduce an air diffuser with an appropriate material according to the purpose of use of the waste water. PTFE/EPDM Recommended product (EPDM processed with fluorocarbon resin) It is suitable for preventing deposits of calcium, silica, etc. It is suitable for the cases such as that it is not possible to prevent deposits with EPDM at a chemical plant, that the amount of adhesion of slime is large at a sewage treatment facility, etc. EPDM (Ethylene, propylene rubber) It has excellent mechanical strength, heat resistance and alkali resistance, and it is a widely-used material in water treatment including O-ring, packing, etc. We will solve the problems of customers with the high technical strength built up through 45 years of history and many accomplishments! 1969 "Synthetic resin porous diffuser plate/ tube" was born. CharacteristicsThe problem of cracks is resolved, and weight reduction is realized. ChallengesClogging occurs. It is not fine bubble. 1989 "Synthetic resin porous body whole surface aeration diffuser" was born. 2006 A panel-type membrane, "superfine air bubble membrane diffuser" was born. Copyright © DAICEN MEMBRANE-SYSTEMS LTD.